Again, the narrator, Eric "Tubby" Wilde, tells this story in the first person. A year has passed and Steeley is over from America and having a reunion meal with Tubby and Brian Ballantyne, although Brian is late. Brian has been delayed at an inquest into the death of an ex-RAF pilot working for the police by the name of Brance. Brance has been killed in a plane crash and his last words were, bizarrely, "mind the dog, the white dog". Inspector Wayne arrives and discusses the case and asks Steeley, Tubby and Brian to help him solve it. Steeley goes to investigate the scene of the crime and finds strange depressions in the ground, as if made with the end of a heavy cane or walking stick. Flying away, our heroes see another plane land near a remote cowshed and they go to investigate. The pilot is a girl who has just returned from France bringing with her she says, a very dear friend, a white dog. Steeley withdraws gracefully, but he is convinced that the "girl" was really a man. Returning to their base at a nearby flying club, our heroes have their first encounter with Count Cortusoides, a Greek millionaire. He is a man who walks with a heavy walking stick and various other clues point to him having been at the scene of Brance's death. When the Count leaves, Tubby has cause to lend his aircraft to one of the club's instructors called Jerry Larkin. Jerry is killed in a crash and it becomes clear that Tubby's plane had been sabotaged. Steeley decides to go and investigate Gartholme Towers, the home of Count Cortusoides, as it is quite close to the cowshed where the "girl" with the white dog landed. Unexpectedly they meet the Count in his grounds and find themselves invited in for a drink. Steeley lets slip that he himself was a villain and tells some true tales of what they have got up to in the past. As they leave, a strange female throws them a note claiming to be a prisoner and asking to be saved. 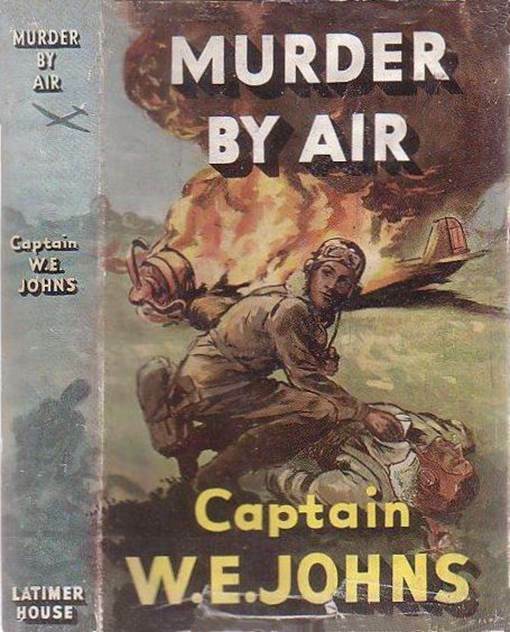 The Count has a number of aircraft on his property and when one of them flies away, Steeley gets Brian to steal another of his planes in order to follow it. Arranging to meet Brian when he returns at the field where Brance was murdered, Steeley and Tubby are astonished to see Brian's plane return but with the Count on board! Returning to the clubhouse, Brian is there. The Count plays cat and mouse with them all and obviously knows a lot more than he is letting on. Our heroes all return to Gartholme Towers with the Count where one of the Count's pilot's called Bromfelt causes a scene and the Count has him killed in a clever way. The Count asks Steeley to work for him and Steeley agrees. Our heroes all stay the night and in the morning, Steeley and Tubby are sent to the South of France whilst Brian is held back at the Towers, clearly as a hostage. On their return they are arrested by the police as they have ten pounds of drugs on board, the Count has set them up! The Count then sends his men to help them escape but now, as Steeley and Tubby are "wanted" men, he has a hold over them. The Count then reveals the extent of his operations to Steeley and Tubby. The next job that the Count has for them is to take a mystery man referred to only as "Mr. X" to Germany. This Steeley and Tubby do, but they are forced to land in France. When Steeley's aircraft is shot at by French Air Force planes, "Mr. X" is killed. Steeley searches his body and finds some top-secret plans of a new aircraft. Eventually reaching their appointed rendezvous, Steeley and Tubby find the Count already there. He is furious at what has happened. The Count is with his 'daughter' who is called Helene, and she is the "girl" that Steeley suspected was a man, the one who had the white dog. Helene flies the Count, Steeley and Tubby back to England but the Count discovers that Steeley has the plans that "Mr. X" was carrying and had been lying when he said he knew nothing about them. Needless to say, there are problems in the plane and it lands near the French coast. Here the Count murders a French gendarme and escapes with Helene in the plane. Steeley and Tubby are forced to steal a plane to get back to England. Steeley knows they have to return to Gartholme Towers but firstly goes to investigate the cowshed nearby. At some nearby ruins a secret passage to the Towers is discovered when the mysterious woman prisoner at the Towers appears. Brian has helped her to escape and he is still at the Towers. This woman is the real Helene and she is not the Count's daughter, but his cousin. The Count has stolen her fortune and kept her prisoner ever since. Tubby is sent to take Helene to safety and get Inspector Wayne and the police. The Count captures Tubby but Helene gets away. Tubby is locked in a tower room but by climbing out on the window ledge is able to get to another room and escape. Tubby finds Brian and sets him free. Trying to escape via the secret passage, they meet with Steeley coming the other way. He is being pursued. A tricky situation is resolved by the arrival of Wayne and the police. The Count and his gang try to escape by plane but they are killed in a plane crash.